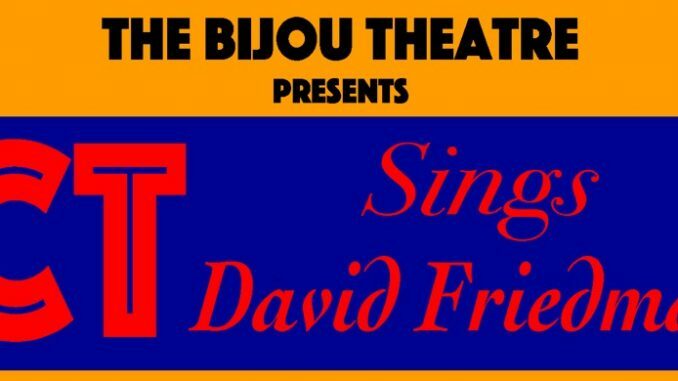 Saturday, May 7th – 7:30 pm – CT SINGS DAVID FRIEDMAN – The Bijou Theatre at 275 Fairfield Ave., Bridgeport, CT, welcomes DAVID FRIEDMAN – Broadway, film and television composer. 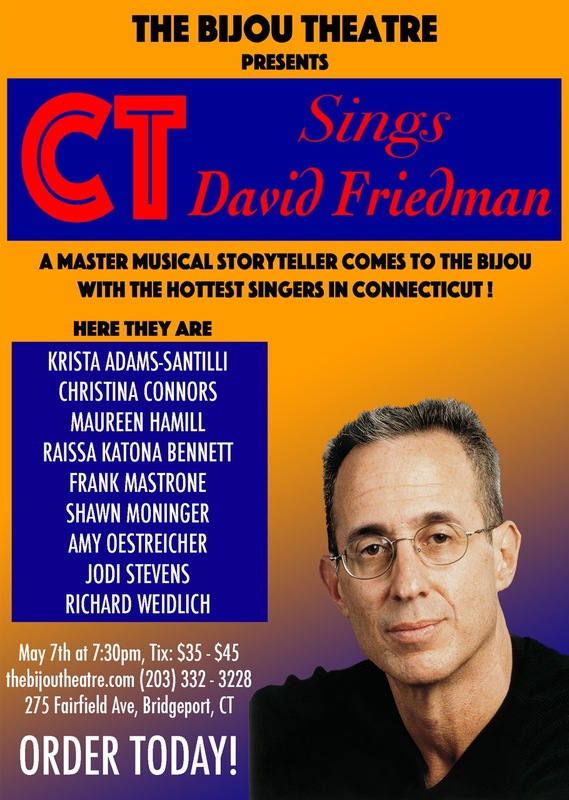 I’m thrilled to sing for my good friend, David, with many old friends and Broadway colleagues, all of whom reside in CT: KRISTA ADAMS-SANTILLI, CHRISTINA CONNORS, MAUREEN HAMILL, FRANK MASTRONE, SHAWN MONINGER, AMY OESTREICHER, JODI STEVENS and RICHARD WEIDLICH. David has multi-platinum recordings, Broadway shows, Disney animated films, and television scores to his credit. After spending several years conducting musicals on Broadway, including GREASE, JOSEPH AND THE AMAZING TECHNICOLOR DREAMCOAT, and SONG AND DANCE, David went to Hollywood where he was the conductor and vocal arranger on such Disney classics as BEAUTY & THE BEAST, ALADDIN, POCAHONTAS and THE HUNCHBACK OF NOTRE DAME. Don’t miss this “One Night Only” special benefit event. 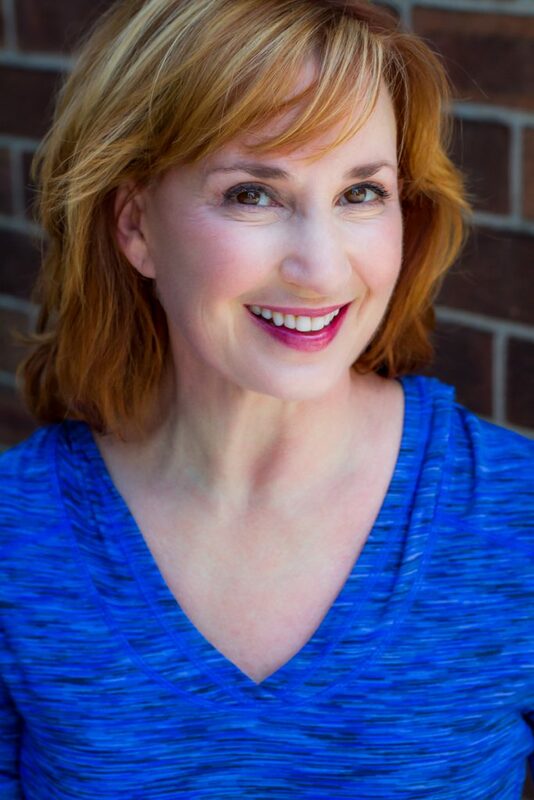 Tickets are $35 & $45 at: thebijoutheatre.com or call 203-332-3228. Meet Pooh Bear & Lucy – our chihuahua foster pups!